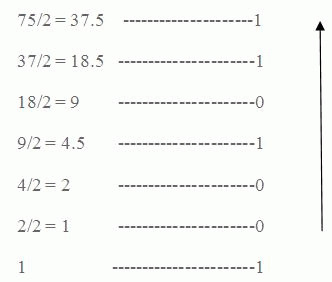 This worksheet help you to understand how to perform decimal to binary conversion. It is used to perform Decimal to Binary Conversion. As we know the binary values are with 0's & 1,s. Hence its base value is 2. Step1: If the number is odd , write 1 on the right corner (or) it is even means write 0. Step3: Continue the step 1 & 2 until end up with 1. Step4: Note the final binary value from bottom to up. 10010112 is the binary equivalent. When you try to perform such conversions, this decimal to binary converter can be used to verify your results of calculations.